The kitchen in our house has always been my least favourite room. When I looked into decorating it, it felt like a huge job because there wasn't really any of it that I liked - minus the size as it's quite a large kitchen / diner. It seemed to be one of those tasks that I just didn't know where to start, but now we've lived here just over two years I've managed to give it the overhaul it needed within a couple of weeks and I can't describe the level of content it's brought. Now that the base of the kitchen has been sorted, those hideous birch wood cupboards are no more and I have finally waved goodbye to the garish perfect prep machine and bottle steriliser I feel as though my kitchen is mine again. However I naturally want to add some finishing touches, so that everything ties in together. Not through much choice of my own, our kitchen in monochrome. Our worktop is a black granite and the thought of changing that up presented us with too much of a headache and strain on our purse strings, it was brand new when we moved in, so in reality was probably a little indulgent to want to replace it - thus setting the tone for our monochrome kitchen. I really do enjoy cooking so I'm incredibly happy that our kitchen is almost a room where I can feel totally at peace in. 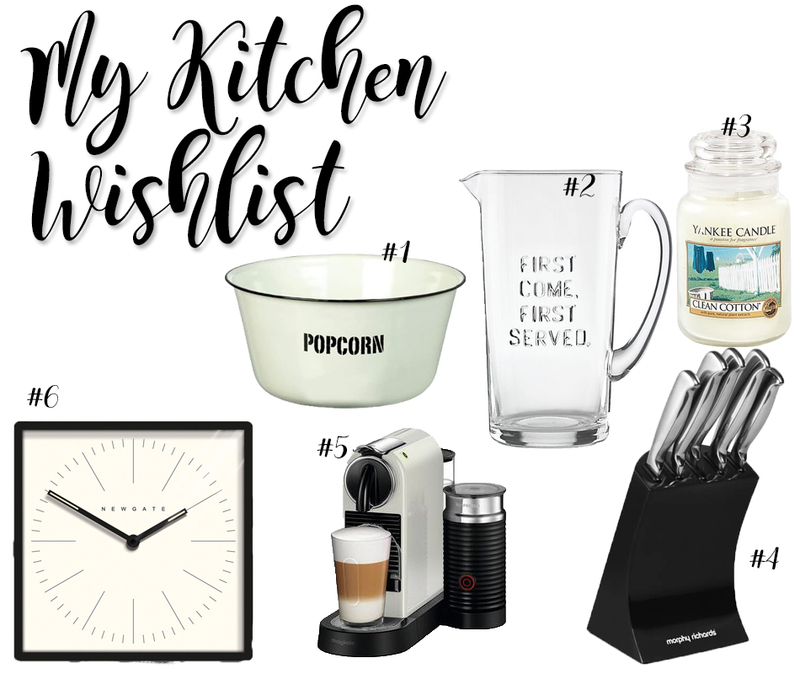 I raided Love the Sales as I'd heard they were pretty fantastic for bargains, and sure enough it came up a treat in showing me what I have to have in our new kitchen. First up where a couple of novelty pieces, I loved the popcorn bowl and thought it would be great for our family film nights we've started with Noah, each weekend we let him stay up that little bit later and all snuggle down to watch a classic, popcorn can be a healthier alternative to most treats so it's a win win really. Candles are always an essential, especially on a day like today when I'm making a cauliflower curry, it doesn't give off the nicest scent so a fragrance like the simple Clean Cotton by Yankee is perfect. I've been searching for a monochrome knife block for ages and I squealed inside when I clapped eyes on this beautiful Morphy Richards number, though I think I'd ban anyone from actually using them - a show knife block only. Lastly, a coffee machine. We actually own a dolce gusto machine I do believe it's called and it's absolutely pants - I've read the instructions a thousand times and it still produces watery coffee, I despise it that much it's shoved in the back of a cupboard somewhere. This baby would take pride of place and after asking online, I've heard such good reviews. I will be showcasing my kitchen soon, when I have added these final pieces so keep an eye out! Oh such pretty things! On my kitchen wish list is atm & has been for a while; light blue SMEG toaster. That would be the dream! I would love to get our kitchen redone, but we need new cupboards really so it's not going to happen anytime soon.